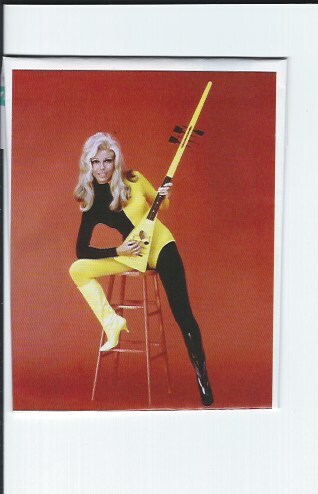 Nancy Sinatra with her Boots and her Kook-A-La-Lee, designed in the 60’s by Ancil Swagerty as part of his Kooky Uke line. Peggy Pfaff has one of Swagerty’s Treholipee’s; both of these ukes could be stuck in the sands so the owner could go surfing. I don’t think Nancy used her boots for surfing, just walking.